Unleash the power of the gods on a quest to defeat the lord of the underworld! Along the way, you'll also heal a poisoned land and restore the lives of the people that populate it. Unleash the power of the gods on a quest to defeat the lord of the underworld! Over time, mankind's faith in the Greek gods faded, allowing Hades to escape the kingdom of the dead and wreak havoc. 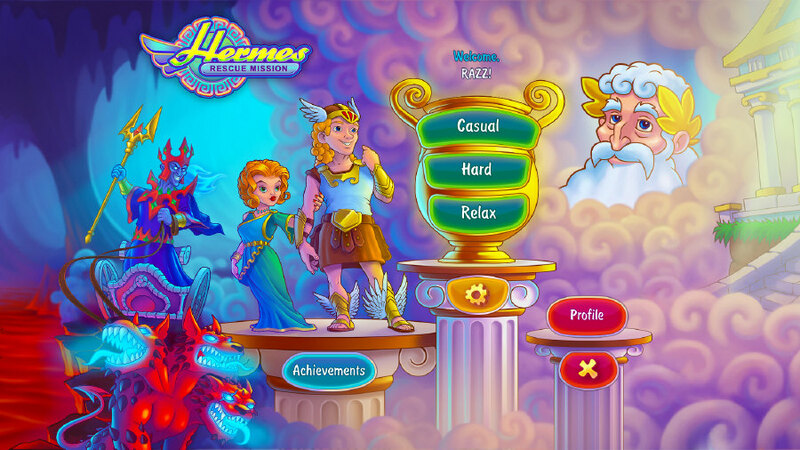 As the demigod Hermes, you must slip on your winged sandals and lead a team of rescuers across a decimated land in pursuit of your enemy, saving the people you encounter and their homes as you go. The servants of Hades will be waiting for you around every bend and turn in the road. To secure the help of Zeus, Ares, Artemis and more, you'll need to restore their demolished altars and make sacrifices in their name. Only then will you be able to use the unique skill each god grants you to defeat satyrs, a three-headed beast and more. You'll also be granted the ability to heal a poisoned land and restore the lives of the people that populate it. Each thrilling level will challenge you to remove cleverly placed obstacles and figure out the quickest way to gather and produce the resources you need. The faster you succeed, the more stars and achievements you'll earn! For casual players who want to enjoy the captivating story, vibrant visuals and addictive gameplay, but have a relaxing experience, an untimed mode is available as well. Thank you so much, Razz. Unfortunately, not working on casual. Thanks anyway. The solution is not working on casual. But thanks anyway. No way to get past level 48 in hard mode. Even tried a real W7 machine, but game hangs after stars are put into place. Tested W10, W10 with compatibility mode, W7, full screen, windowed, with and without sound and music. It was fun will it lasted. Thanks. But after winning level 49 on hard mode, the game gets stuck: you see it gives the three stars, but then it doesn't move on and the only thing you can do is close the game. I reinstalled over the original game and have just finished levels 49 and 50! What do you mean with original game, the version from Alawar/Wildtangent or the file provided from Razz?